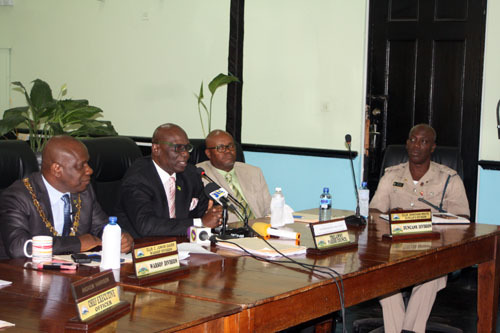 Minister of Local Government and Community Development, Desmond McKenzie, is of the view that what is needed to rein in crime and violence in Trelawny is a collective approach of the citizens in tackling the issues. He was responding to an update given to him by the crime chief, Superintendent Dwight Powell, in regards to the crime situation in the parish. Minister McKenzie told a gathering of stakeholders in Trelawny on Thursday that everyone has a role to play in dealing with the question of crime and violence. “Tourism is an important component to the resources of Falmouth and while the local dollar is important, it is also essential to protect the tourism dollar,” he disclosed. Superintendent Powell had highlighted that while major crimes were down in the parish, there was still a challenge with murders. The parish, he explained, has already recorded 20 murders this year compared to 15 over the same period last year. He indicated that there was some measure of gang warfare that they needed to bring under control, noting that currently there was situation in the Bunkers Hill community in the Wakefield police division where on Wednesday, law personnel were engaged in shootout with criminal elements. This is the second such confrontation between police and criminals in less than two weeks in that general area. “These are persons who used to make up the Ski Mask Gang, who have come over to the parish,” Superintendent Powell explained. The gang, he points out, is being led by one Adrian Walker o/c ‘Lippy’ and his cronies, and he is appealing to residents with information to come forward to assist the police in apprehending these criminals.